Hello, Dear Readers! Happy Thursday to you all. I have various updates and ramblings to impart today. Are you sitting comfortably? Then I shall begin. Firstly, did you enter the giveaway to win one of three copies of the wonderful Hidden Among Us by Katy Moran, with signed bookplates? The winners will be picked out via random number generator next Tuesday, so you don't have long left - and it really is ridiculously easy to enter. Go on! You know you want to. Secondly! I realised that I forgot to tell you I finished the first round of edits on The Name of the Blade Bk #2 last week and submitted them. Wonder Editor is rushed off her feet with Bologna Book Fair related activities at the moment so it might be a while before she gets a chance to look at the new version. I'm crossing my fingers that I've broken the back of the thing, but as usual by this point I am utterly incapable of seeing that a forest exists, let alone that there are trees in it, so all I can do is wait for feedback with bated breath. But my sanity is slowly reasserting itself, which means that I will soon be leaping into draft #1 of The Name of the Blade bk #3. Holy CRAP, you guys. Everytime I think about writing this book I get a fit of full-body tingling, and I don't even know if it's abject terror, exhilerated excitement or some crazy mixture of both. Wow. Trilogies, eh? In tangentially related stuff, I made a flying visit to London at the end of last week to speak to the London Young Librarian Group at their annual general meeting (that's librarians who are specially concerned with young people, not especially young librarians, in case you were concerned). This was held at Walker Books, and it was a blast not just to present The Night Itself to them (I read from it for the very first time and messed it up because I was so nervous and hadn't practised, sorry everyone) but to get the chance afterwards to speak to so many whip-smart, passionate, dedicated book folk. @MattLibrarian from Twitter was there, too, in his professional capacity - Hi Matt! 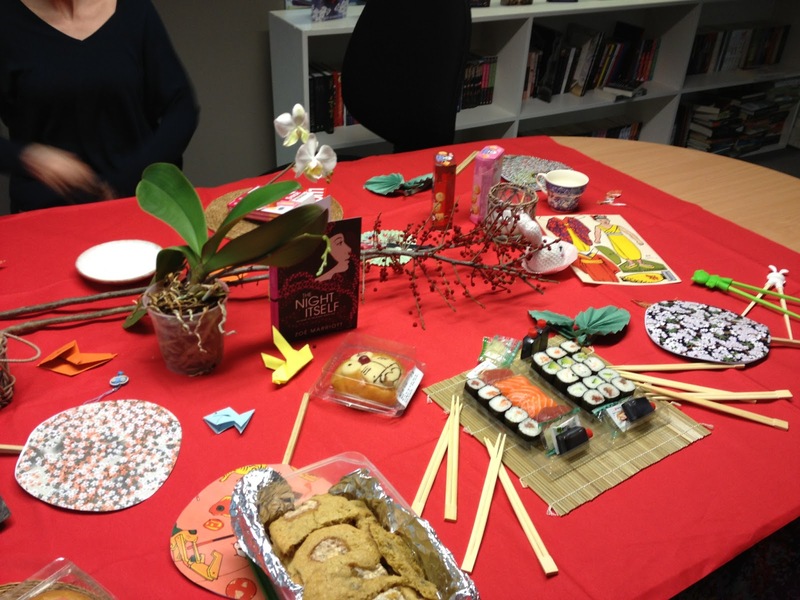 Wonder Editor, Lovely Lass and Delightful Designer had made a special Japanese picnic for me! I wasn't expecting it at all and I was so touched I nearly cried. Among the wonders on this table are a potted orchid and a branch with red berries (a very nice touch), paper fans, a Japanese paper doll (which I was supposed to take home with me, but I think I left it there, darn it) origami swans and fish, wooden chopsticks and *special* Hello Kitty chopsticks just for me and a teapot in the shape of a lucky Japanese cat. They had gone out specially and purchased my *favourite* sushi - not the supermarket stuff which is blergh - and also Japanese buns and pocky sticks and chocolate pandas. Lovely Lass had even brought specially homemade marshmallow cookies! It was amazing! Thank you so much, guys. Apologies for the gubbins picture - it's possible my hands may have been shaking with excitement. Yes! My very own gorgeous copy of Clockwork Princess. I thanked them with my special tippy-toe dance which very few have ever seen and survived to tell of. So it was a wonderful visit. And as soon as I got home I dug out Clockwork Angel and Clockwork Prince and re-read them. By Sunday I was stuck into Clockwork Princess and it was... *waves hands* it was... argh. I can't even. It exceeded my expectations. It was nothing I expected and EVERYTHING that I needed it to be. It totally emotionally wrecked me and I spent most of the day crying at the beautiful bittersweetness of the conclusion to this powerful story. Everyone knows I am a huge The Mortal Instruments fan, but I think with this, The Infernal Devices has actually surpassed TMI for me. My heart feels three times bigger than it was when I began to read about these characters - these damaged, courageous, wonderful characters - and I just take my hat off to Cassandra Clare both as a reader who loved every second AND a writer who can guess how much must have gone into creating something so truly brilliant. Which brings me back, via a sideways route, to The Night Itself and The Name of the Blade. Because I've basically spent the past year and a half loudly moaning 'Why? Why did I decide to write a trilogy? What is wrong with me?' and begging everyone I meet to whap me upside the head if I ever mention being possessed of such a stupid idea again. But reading Clockwork Princess did something marvellous; it reminded me why. It reminded me why The Name of the Blade needed to be a trilogy - could ONLY have been a trilogy - and why even with the huge challenges and changes to my standard processes that a series brought and will bring, I am SO GLAD it's a trilogy. HIDDEN AMONG US: Review & Giveaway! The mysterious boy who Lissy encounters at a deserted train station acts like he has known her all her life. Unnerved by his unnatural beauty, she sets about uncovering the dark secret of the village of Hopesay Edge. The boy, Larkspur, is a member of the Hidden, an ancient group of elven people whose heritage is buried at Hopesay Reach. 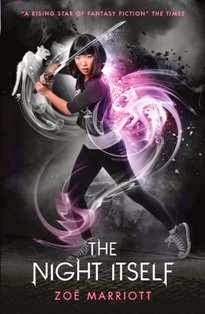 Before long, Lissy and her brother Rafe find themselves caught up in the fight against terrible magic. But a bargain has been made that cannot be broken, and if the Hidden catch Lissy now, they will never let her go. Having read the synopsis above, I bet you think you know exactly what kind of a book Hidden Among Us will be. If you have any familiarity at all with paranormal romance and modern fantasy tropes, you will already have pegged the well-known stock characters of mysterious boy (with added unnatural beauty! ), and intrepid girl, and plotted out the rest of the story in your head. He and Lissy are destined lovers who will fall madly for each other. Lissy's parents will be conveniently absent for all this, or so detached/consumed with their own lives that they they don't notice what their daughter is up to. After a series of shenanigans which only increase the pair's passion, they will figure out a way to be together despite their different worlds and all will be well. Oh ho ho, Dear Readers. How wrong can you be? Hidden Among Us is not that book. It's a dark, twisting, bittersweet tale of profoundly damaged family relationships, of broken hearts and broken promises, revenge and magic, and of how (especially here in Britain, with our layers upon layers of history, atrocity, folklore and prejudice) some part of the past is always waiting around the corner or lurking underfoot to suddenly swallow you up, just when you least expect it. This is not a paranormal romance. It's a fantasy of a most unusual sort. There are no stock characters here. We have Rafe, the smart, competent, tricksy teen who ruthlessly and rather tragically attempts to use his cleverness to try and circumvent fate. We have Lissy, the brave but over-protected girl who can't understand or quell the wildness within her, and therefore can't figure out her place in the world. We have Larkspur (my favourite) an honourable man torn between what he knows to be right and what seems to be inevitability, trapped in his father's shadow. We have Joe, steadfast and steady, yet secretly and deeply romantic. And we have a network of parents and siblings and stepsiblings and other relatives all tangled around them, each with their own agenda and complicated backstory. I'm not going to elaborate on the plot or its events. They do, basically, fit with the back cover copy that you read above. But not the way you think they will. This is a very tightly written book and almost anything I could write here would be a spoiler; not necessarily a spoiler in terms of telling you how the book ends, but more in how those events unfold. Part of the delight of this story is that pretty much nothing in it is what you would expect. That's what made ME fall in love with it, and I'd like you to have the same experience. Hidden Among Us is beautifully written, in a spare, lyrical style which reminds me of the best kind of poetry. It paints stark, striking pictures of the landscapes that it inhabits; the spooky old house, the surrounding countryside, the features of the world of the Hidden. The elegently simple descriptions of things both mundane and unearthly give the whole story a wonderful ring of truth. Katy Moran also illustrates the intricate web of secrets, unspoken truths, grey areas and unwritten rules that make up most family units. Each character within Lissy's extended, blended family is characterised by their love for and conflict with the others, which is a delicate sort of balance and very well done. From the outside the way that families interact is often incomprehensible and can even seem faintly mad - but within families, growing up in them, you don't question or doubt the Way Things Are. 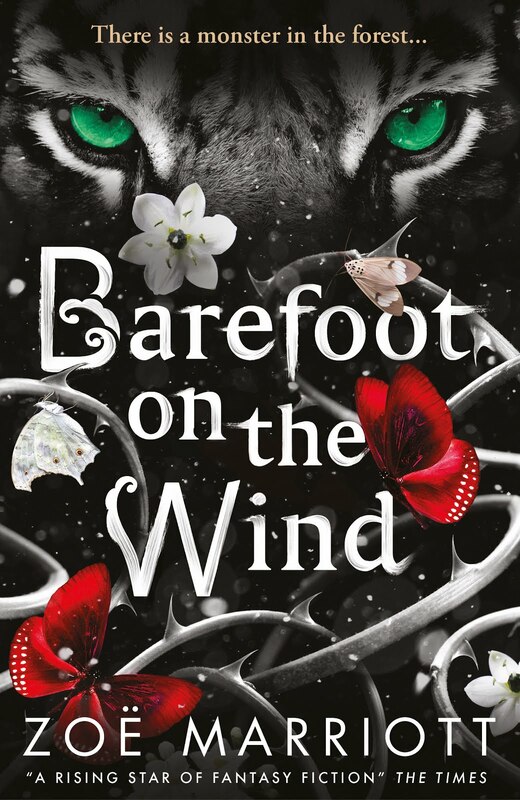 Katy Moran puts us in the middle of Lissy's family and slowly peels back the layers to reveal an extraordinary history of sacrifice and deceit that's only hinted at in the book's tense first chapter, and a truly terrifying darkness which has been lurking behind the everyday conflicts all along. Love shines through this story. Not just the love of the characters for each other, but the author's love of the British countryside with its beauty and it's unexpected dangers and its strange, ancient nooks and crannies. Love for all those fascinating layers of British and Celtic folklore and mythology. Not the prettied up versions; the real, uncomfortable, sometimes brutal ones that give you a little jolt when you read them because they seem a bit too familiar for comfort, and at the same time bewilderingly alien. I loved the way that the Hidden were characterised - they are frighteningly inhuman but at the same time it was *also* frightening how human their feelings and motivations could be. Reading this book, I was strongly reminded of The Power Of Three, one of my favourite Diana Wynne Jones novels. I highly recommend it to anyone who is a fan of that story, or indeed any of Diana Wynne Jones' work. Hidden Among Us closes just as the eye of the storm falls upon the characters, trapping them within a temporary peace that they are fully aware cannot last. 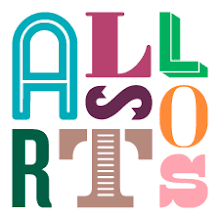 It offers no easy solutions and no pasted on happily ever afters. It's a wonderful, truly unique book. The sequel will be out next year and I, for one, cannot wait to see how this situation resolves itself. Given all that, how would you like to win a copy? Because I have THREE to give away - each with a bookplate that's signed by Katy Moran herself - and it's really easy to enter to win them! 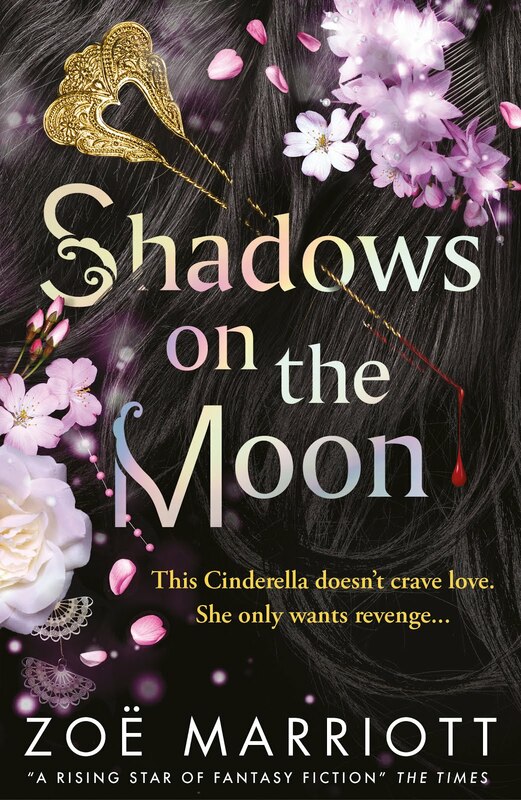 Just tweet about this giveaway - linking back here, obviously - with the hashtag #HiddenAmongUs. That's it! The giveaway will be open to people in the U.K. only (sorry, guys!) and will run for one week. I'll put everyone into the random number generator and pick a winner on Tuesday next week. Remember that you must include that hashtag in your tweet, or I won't be able to find your entry. And you can feel free to tweet as many times as you like, for extra entries - so spread the word! Hello, and happy Thursday my ducky darlings. 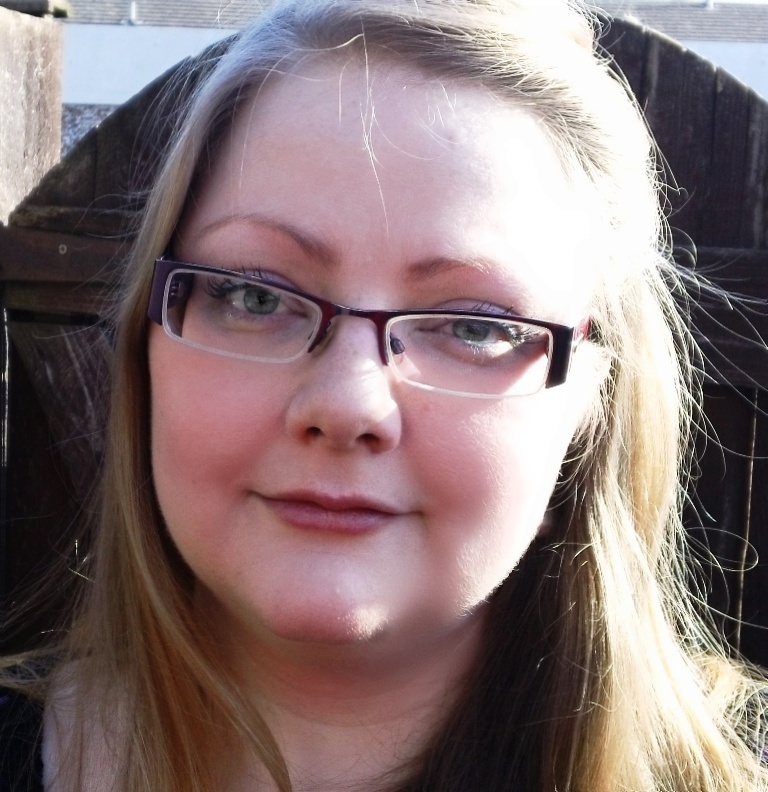 Today I'm introducing you to a fabulous author - Katy Moran - who has the same publisher as me and is the author of several wonderful fantasy novels and a dark contemporary romance. I was lucky enough a few months ago to get my hands on an ARC of her new book, Hidden Among Us, which came out on the 7th of March. After reading it I immediately started badgering Katy to come on the blog and do an interview. I also managed to get three finished copies of Hidden Among Us from Walker Books and will be hosting a giveaway for them, along with bookplates signed by Katy, next week when I do my official book review. Zolah: First of all - welcome to The Zoë-Trope, Katy! I absolutely LOVED Hidden Among Us. It's just the most wonderful, unique, bittersweet story, jammed full of lovely British and Celtic folklore and mythology. It reminds me most of books by British authors like Diana Wynne Jones, where the reader is offered no easy solutions and nothing is predictable. Can you remember the initial spark of inspiration that started Hidden Among Us growing in your brain? What was it and how did it come to you? Katy: Our creepy and mysterious folklore traditions have been lurking in the back of my mind since I was a child, but I think the actual spark of inspiration for Hidden Among Us came from two different places at two different times. I used to do quite a bit of festival work – I'd started out volunteering at Glastonbury in 1999 and ended up working in my friends' cafe for pretty much the whole of summer 2007. It was a time of torrential rainfall (streams of water running through the kitchen), hysterical laughter and a sort of devil-may-care blitz spirit. After a very wet and muddy festival, my friend Annabel and I finally got away from the Glade at about 4 in the morning, pulling up at a nearby petrol station soon afterwards. There was a smart shiny red car at the pump ahead of us, and I remember watching in total fascination as two very tall, leggy and beautiful festival-goers climbed out, picking their way across the forecourt. They were out of this world. Annabel and I were still completely covered in mud, but these guys had taken the festival look to a whole other level, clad in very little but scraps of floaty leather and some feathers. They just looked totally otherworldy (and hilarious, out of context). I've often seen amazing-looking people lurking in the early hours at festivals or big outdoor parties, and thought how almost inhumanly gorgeous they were. So stumbling across unusual people like that was definitely one source of inspiration for the Hidden, but I'm also quite fascinated by the effect of rainy English sunlight glancing off bodies of water – puddles, rivers or lakes. When that weak rainy light turns the puddles on the lane silver, I think they look like doors to another world. See also the final question here about a certain song! Zolah: While you were writing, who or what did you feel was at the core of the book: the element that you loved the most or which was most important for you to get down on the page? Katy: I think that the most important aspect of the book is the family bonds between the brothers and sisters, and how love in its many forms can make us turn to the most unexpected and often even downright dangerous or damaging course of action. Zolah: What is your writing process like? Are you a planner or a pantser? Do you write long-hand or type directly onto a computer? Where do you normally work? Katy: I learned to touch-type when I left school, so I always type directly on to my laptop. That way I can write at the speed of thought – sometimes very fast, sometimes extremely slow! I usually start out with a character and a basic plot arc. I did a chapter by chapter plan for Hidden Among Us and its sequel, but I'm not really sure how helpful this was. With the sequel, I got bogged down in it a little bit and became stuck a few times – quite late on in the writing process I realised that in this case I would have been better off brainstorming my characters and their motivations. When I first set about writing Hidden Among Us, I didn't actually know one of the most important facts about Lissy, my main character. Without wanting to give this away, all I can say was that it came as a real flash of inspiration when I got a bit closer to Lissy as a character. I had a sudden realisation about her. I usually work with my laptop on the sofa, which is actually playing merry hell with my back! When we move in a few weeks, I'm going to have an outside office, and will start working at a desk again. Zolah: Oooh, *speaking* of the sequel to Hidden Among Us... Can you tell us anything - any little detail - about the new book? Katy: In the sequel to Hidden Among Us, we get to hear the Hidden's side of the story, and it all gets quite scary! There are also some new Hidden characters introduced, as well as the usual betrayals and counter-betrayals. Zolah: If you had to a song to listen to right now, what would it be and why? Katy: Reynardine by the Fairport Convention, sung by Sandy Denny. She had such a wild and beautiful voice - perfect for a story about a mysterious and dangerous young man encountered one night. This song lit a spark of inspiration that smouldered for many years. Sounds right up my alley. Thanks so much for taking time out to satisfy my curiosity, Katy! If you'd like to learn more about the book and about the process of getting it from idea to publication, check out the earlier stops on Katy's book tour, which you can see listed in the lovely banner to the right. And if this has whetted your appetite to read the book, remember to come back next Tuesday and enter for a chance to win one of THREE copies of Hidden Among Us, and signed bookplates too. MEGA EXCLUSIVE THE NIGHT ITSELF GIVEAWAY: Winner! Hello, Dear Readers! Welcome to Tuesday. 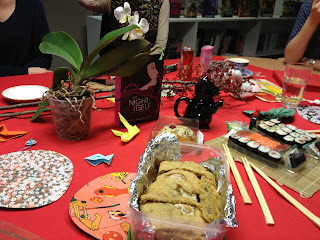 Today I'm revealing the winner of the very first Mega Exclusive The Night Itself giveaway. Thank you to everyone for entering and for adding the book on Goodreads and spreading the word about this giveaway. Yay, Laura! Congratulations! Get in touch and let me know your address ASAP so that I can give it to Lovely Lass, who will dispatch all this booty to you, you lucky thing. If you entered this time but didn't win, you're probably feeling pretty rubbish right now. BUT! There will be another giveaway next month with an identical prize to win - including an ARC of The Night Itself - and then ANOTHER the month after that. So you have two more chances to win (and after that it's only another month until the book comes out anyway). And just in case that's not enough? 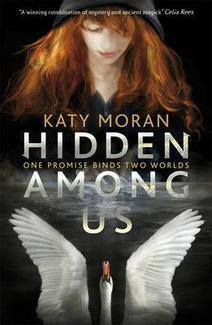 I'm doing a giveaway of three copies of Katy Moran's wonderful new book Hidden Among Us next week too. So stay tuned for that. Thursday's post, which is an intriguing interview with Katy, will be a scheduled post because I'm going to be travelling that day. What this means (for those of you who don't spend your spare time faffing about with blogs) is that I'm going to try and set blogger to automatically post it for me at a certain time. However, in the past I've had very little luck with getting blogger to do this. So if the post doesn't turn up early on Thursday morning, nobody panic. I will post it when I get back home Thursday afternoon. This is part of Katy's blog tour for Hidden Among Us (see lovely banner to the right) so you can check out the other great posts related to the book if you need something to do in the meantime. Hello, hello, hello my duckies! Happy Thursday to all! Have you entered the MEGA EXCLUSIVE THE NIGHT ITSELF GIVEAWAY YET? If not, get on that right now - you only have until Monday.
" I fell in love with sassy, courageous, wise-cracking Mio from page one." -- Ruth Warburton, author of A Witch in Winter and A Witch in Love. I'm so happy that three such *wonderful* authors liked my book and decided to endorse it this way! So, to celebrate, I thought I would give you some The Night Itself SPOILERS. Well, not proper spoilers. Just the chapter titles for the book - inspired by Cassandra Clare's recent reveal of the chapter titles for Clockwork Princess (OMG, out in FIVE DAYS, I cannot WAIT, eeeeiii!). The Night Itself was the first book where I actually used chapter titles instead of just chapter numbering, and I had a lot of fun coming up with tangential puns which probably no one but me will think are funny. They don't reveal as much as they might seem to, perhaps... but they do reveal a bit. So if you're very spoiler averse, avert your eyes now. Yep, the final chapter is named after the book. This is something I hope to carry through the whole trilogy, for reasons which will become clear later on (she said mysteriously). So what do you think? Are your appetites whetted? Only one hundred and thirteen days to go! Welcome to Tuesday, Dear Readers. 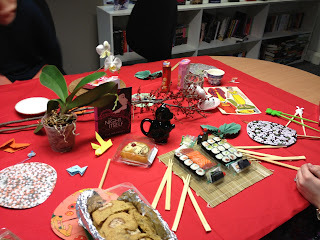 I have a random selection of (as the post title suggests) stuff to share with you today. But firstly - if you live in Europe and you haven't entered the MEGA EXCLUSIVE THE NIGHT ITSELF GIVEAWAY yet - why not? Get in there. The giveaway will end on the 18th so you don't have all that much time. Next up! You might remember I mentioned last year that FrostFire would be getting a German translation? The rights were bought by Carlsen Verlag, which is a huge deal as CV are the ones who publish Stephenie Meyer, Melissa Marr, Kristen Cashore and Lauren Oliver among many other English language and international bestsellers. 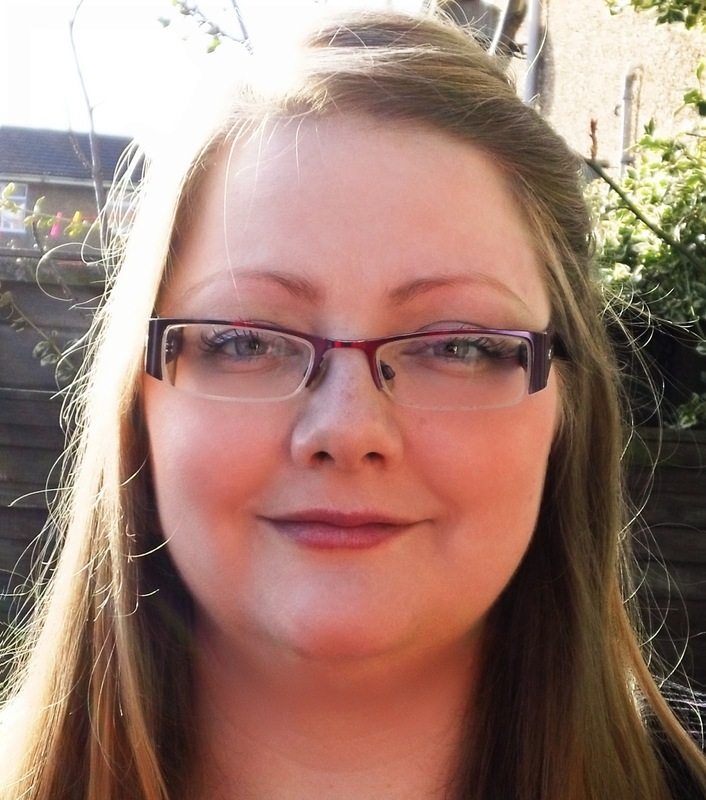 Now I got an email recently asking for a new author picture for CV, as apparently the one you see everywhere else (including here!) wasn't high resolution enough for their catalogue. So I went around with my digital camera and got my dad to take some new snaps in the garden in a brief burst of spring sunshine. I sent two off to the German publisher to use, after asking for people's opinions on Twitter. This made me think - maybe it's time to update the author picture that I use here, on my website and on Facebook, among other places? The one with Finn, while I've always loved it, is nearly four years old now and I although I'm recognisable I don't really look the same these days. Here are the two photos I sent to Germany. What do you guys think? Should I pick one of these as my new universal author pic? And if so, which one? "The water-creature writhed and whirled, as graceful as a silk ribbon moving in the wind. It dived, then came back up again with a crash of water as a second white head rose beside it. 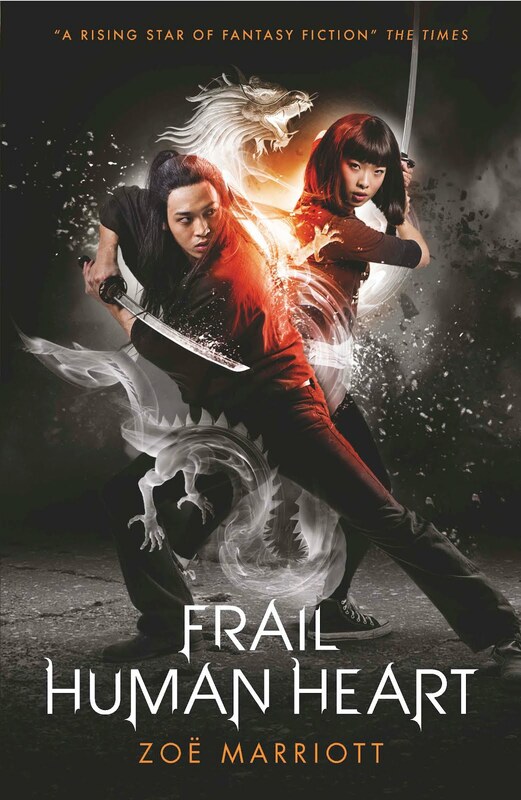 The two creatures – water dragons – darted and snapped at each other, now entwining, now struggling apart." Spoiler free! Heh. You have no idea how LONG I had to search for a single paragraph that was spoiler free. This whole book is a spoiler for The Night Itself, it's crazy. I'm also thinking about when I should reveal the title of bk #2. I haven't kept it secret because I haven't got an official title yet, or because it's still up for negotiation or anything, in case you were wondering. The titles were one of the first things that I knew about the trilogy, even before I had worked out exactly what was going into each story (this will make sense to you eventually, presuming you read all three books). And as far as I'm aware all the titles for the individual books have the go-ahead from the publisher too - my editor seems to like them. It's more because the titles mean so much to me that it seems like a good idea to hang onto them and reveal them carefully. Ideally I'd like to keep the title of bk #2 secret until the cover is ready to show you. I just don't think I can possibly pull that off, since things always turn up on Amazon way before I expect them to. In which case it would be great to do something else special with the reveal... I'm just not sure what. Again, answers on a postcard or in the comments! Hello and happy Thursday, my duckies! Today I'm going to tell you about a plan cooked up between Lovely Lass and me to get The Night Itself's title out there and hopefully generate some excitement and buzz around its release on July the 4th of this year. What's great about this plan is that it's going to run for three months and give you, my loveliest and most delightful Dear Readers, the chance to get your hands on a veritable treasure trove of wonderful prizes... on THREE seperate occasions. Each and every one of these is completely exclusive to this giveaway right now. There's no way to own any of these things other than to win them from us. The posters and notebooks? I had them specially made for this - there are four of each in existence. One will stay with me, and the others are for you. The advanced reader's copies of this book are being so tightly controlled that I only own one myself. 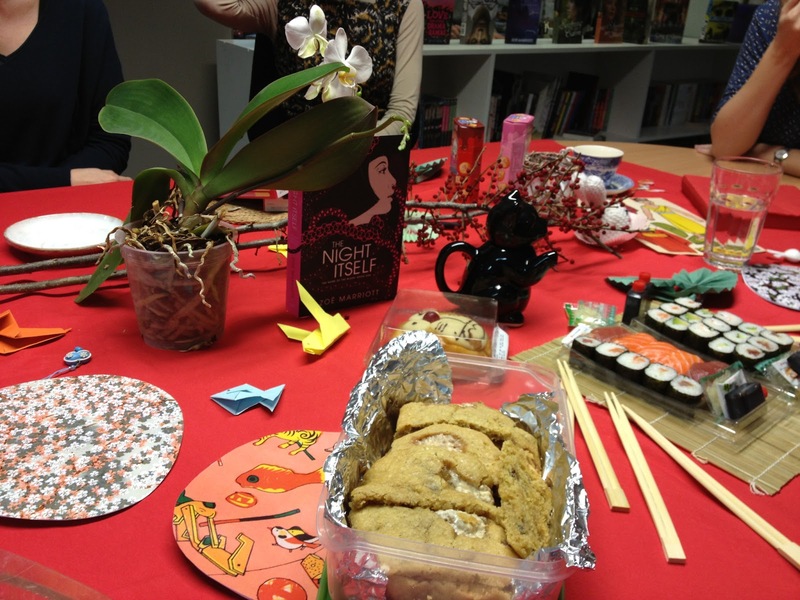 Lovely Lass has possession of the rest and will be sending yours out to you straight from Walker Books in London. That's how exclusive they are. ...last night I finished THE NIGHT ITSELF. It's shattering. I loved it so much. Wish I had read at 15... It's amazing – it was like someone had slipped something hallucinogenic into my cocoa. So real. So scary. So! What do you have to do to be entered for a chance to win all this amazing stuff and read this book MONTHS and MONTHS before anyone else? Well, there are three identical prize packs, and we'll be doing a giveaway now in March, one in April and one in May. I'm going to set a task for you in each month - a task which will hopefully help to raise awareness of the book. This month the task comes in two parts. First: I need you to Tweet, Facebook or blog about this giveaway to spread the word. Second: I need you to add the book on Goodreads. Obviously once you've done both those things you should come back here and include a link to both the Tweet/Facebook entry/blog and your books page on Goodreads where you've added the book. We're going on the honour system so I won't be checking each and every entry, but I *will* be checking the winner's entry, which makes it completely pointless to try to cheat (although I'm sure you guys wouldn't anyway). That one comment which includes both a link to Goodreads and to a Tweet/FB entry/blog will constitute one entry into the giveaway. If you don't have a Goodreads account, it's simple, easy and FREE to open one and I encourage you to do that. There's no age limit and it's a great, fun website that I personally use all the time (feel free to friend me! I promise to friend back). If you don't have a Twitter/FB account or a blog, you can ask a friend or family member to spread the word for you, as long as you provide a link. Entries which attempt to spread the word by leaving comments about the giveaway on other people's blogs will NOT be included. Sorry, guys, but authors/bloggers do NOT like this - it makes them feel like they're being spammed. DON'T DO IT. If you would like to increase your chances of winning? You can get extra entries by spreading the word in additional places. If your first entry was with a Tweet, you can get an additional entry by FBing, or blogging. Or both. Make sure that any additional entries are each left in the comments trail of this post IN A SEPARATE COMMENT. I'll be using a random number generator to pick the winner, so if your new entries are not in separate comments they won't be counted. This first giveaway will close at midnight on Monday the 18th of March. I will pick the winner of the first prize back on Tuesday March the 19th and post the winner's name on my blog that day. Hello, Dear Readers. I hope that you're all well on this fine Tuesday. Before I start properly, here's a link to YA author Marie Lu (who's books I have not read yet, although I plan to) talking about that pet peeve of mine, the idea of 'Boy Books' and 'Girl Books'. Gnargh. Go get 'em, Marie! Now onto me. As normal at this point in revisions (roughly midway through, I would guess? When you're cutting chunks out and then writing new chunks and pasting them in it gets tricky to really know), I am starting to feel the frail bonds of sanity unravelling from around my brain. I mean, I sometimes literally I can feel this happening - like a sort of slithering and then a snap, like an elastic band snapping? In my head? Oh dear. That's not good, is it? So it's going to be tough to get sense out of me before I've sent this off back to Wonder Editor. But I'll do my best with what few wits I have left at my disposal. Luckily, despite the post title, today's blog is not about my edits and my swiftly deteriorating mental state! I'm basically just here to give you a heads up that Thursday's post will be EXCITING. "How will it be exciting?" You cry eagerly. Oh ho ho, I will give you a hint, my little duckies. It will be exciting in a The Night Itself sort of way. A way which involves rare and exclusive goodies of untold wonder which I am preeeetty sure you will very much want to get your hands on, especially months and months before anyone else does. Oh, yes. It is, in fact, an advanced proof-copy sort of excitingness.